At the start of March I had the great pleasure of being the opening DBA shot for the OPASS meeting. 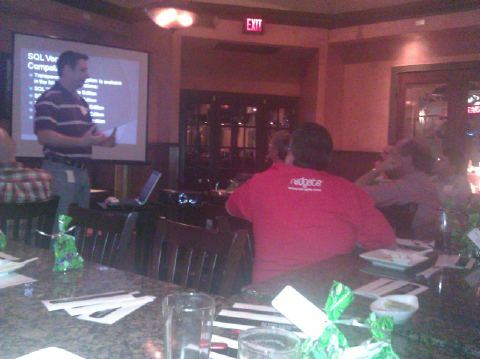 Microsoft MVP Ken Tucker was the main act giving us an inside look at Silverlight MVVM Framework. Going to OPASS is like going to the Oscar’s, the stars in the audience are part of the treat! Everyone had great questions, and they were very interactive. Jack Corbett (blog | twitter) and Karla Landrum (twitter) had a wonderful venue, Rikka Asian Bistro, for the OPASS meeting. During my Talk I had promised to post my slide deck and the script that I used for my Demo, so I wanted to do that right off the bat. So Dear Reader during the talk we covered a couple things. 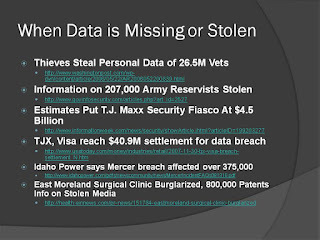 We covered Why you should use Transparent Data Encryption (TDE), How to setup TDE, how to Disable TDE, and the effects TDE has on your backup and recovery Strategy, the slide deck and demo’s are attached so I’ll let you go through those on your own I’m just going to cover things from a logical level. We’ll step through each of those, and then we’ll get to some advanced scripts on how to self manage certificates for TDE. 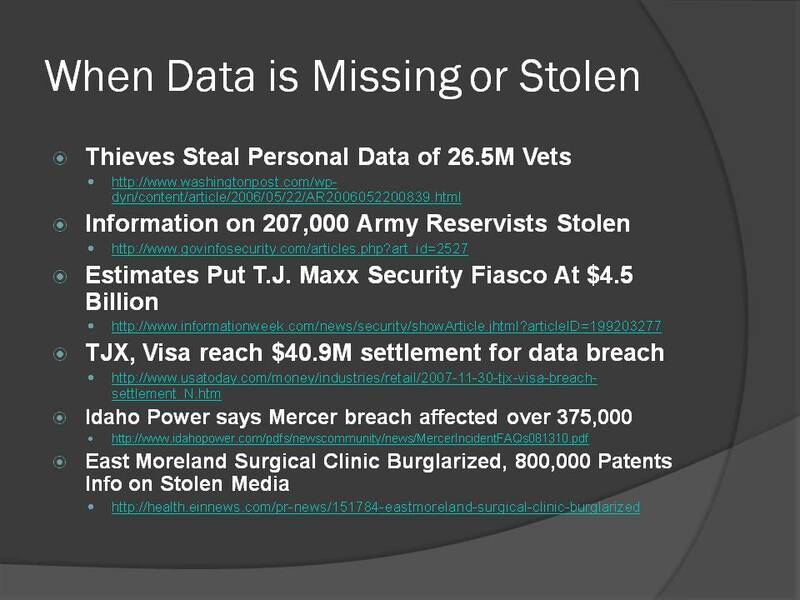 Here is a slide from my deck, and this is the best reason why, if you are a DBA long enough eventually you will find yourself in a situation where a backup is lost, something will get stolen, or something will get hacked. TDE will not save you from every scenario, but what it will do is make so when you are in this situation you have one more level of protection. Well Dear Reader yes it is our back-side on the line, but so is our Boss’s, and the companies. If you take the point of view of Jerry Macgwire “help me, help you. HELP ME, HELP YOU!”. Don’t go and yell at your boss, but you should know them well enough to know to find an approach that they will respond to. If its ROI, bring up how much companies lose in money because of incidents like these, and future loss of customers profit if customer’s confidence in the business is shaken. It’s that easy. After step 4 an encryption scan will begin on the database. It is safe for user activity. The only things you cannot do is alter the database at the Filegroup level. No dropping, no adding. While you are encrypting your database, It’s probably not the best time to be doing changes to the underlying file structure, (one thing at a time!). Keep in mind that the second the 1st user database becomes encrypted with TDE the TempDB will be encrypted as well. “So Balls”, you say, “I turned TDE on my DEV system, did a demo for my boss, we’re not going to use it, how do I turn it off!” We’ll Dear Reader it is pretty simple. When you turn on TDE it affects all Datafiles at rest. All Data Files, Log Files (only the VLF’s utilized while TDE was turned on), snapshot files, and backup files. So here are the things to consider. If you turn on TDE on your Prod system, and you want to do a data refresh to your Dev or Staging environments you will need to restore a copy of the Certificate used to encrypt your Prod databases to your Dev or Staging server where the restore will take place. If you want to use Log Shipping or Database Mirroring you will need to have the Certificate you use on your Primary or Principal Server on your Secondary or Mirror Server. So if you have a Database using TDE, if you are using a technology that uses Restore and Recovery then you will need a copy of the Certificates on each SQL Instance where a copy of the Database will reside. Now keep in mind this doesn’t mean you can’t move data around. TDE works with data at rest. That means that if you BCP data out of the database it is in an unencrypted state. You don’t need to have a copy of the Certificates in your destination. So how does this effect your recovery strategy? You need to backup your Certificates regularly. You need to make sure that you plan for them like you do your backups. If you sweep your backups to tape you’ll want to sweep your certificates to tape. If you back up your databases to disk, backup your certificates to disk. Keep redundant copies. If you ever have to restore your database to a different server you will need them. I’ll be doing covering Key Management in my next post but all of the scripts you will need are in the download. Each of these scripts need a little tweeking, but all the information is there. Hope these get you on your way to learning how to use TDE!